While there's certainly nothing wrong with playing a character in an RPG that's an elf or a dwarf or a human or a halfling, but, for me, I always liked getting a bit more creative with it. Minotaurs, goliaths, and such like that. 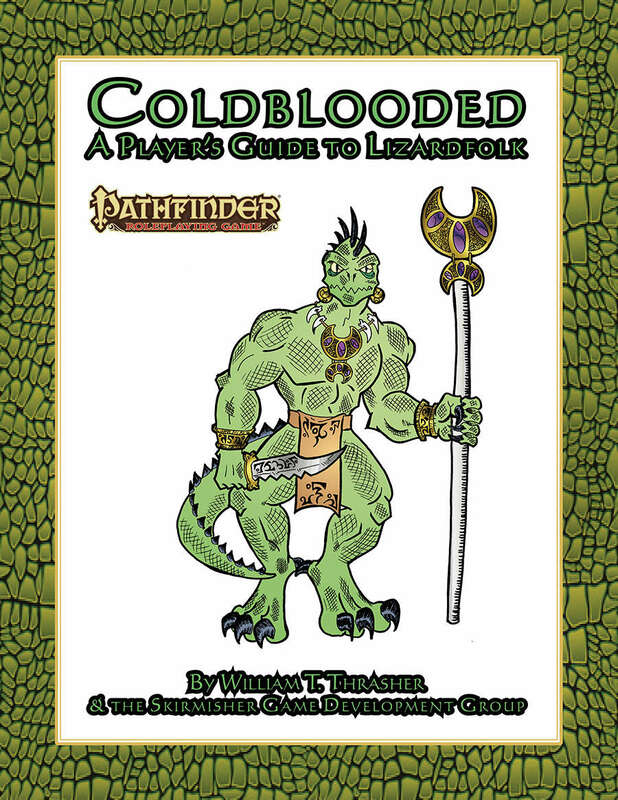 Well, if you want something a bit more scaly, Skirmisher Publishing has released Coldblooded: A Player's Guide to Lizardmen. Wading through the mire of mist-shrouded swamps, dwelling in the shadows of ancient ruins, and lurking in the primeval wilderness just beyond the edge of mankind’s domain, the reptilian Lizardfolk are a cold-blooded reminder of the fragility of civilization. Hidebound and distrustful of the ways of settled races, the Lizardfolk maintain ancient traditions and practice a culture as brutal as it is timeless. This title contains guidelines for playing Lizardfolk as characters and includes details on physical appearance, society, relations with other races, alignment and religion, and typical adventures; alternate racial traits and a new racial archetype, the Dragon Priest; and equipment, including the dragonflight boomerang, macana, grandfather scales, saurian shield, and stalker paste.